"The gun balls would come in through the windows and we would take them and throw them into the river ... and in a few minutes they would come back through the windows, so we were satisfied the Evil One was at the helm." 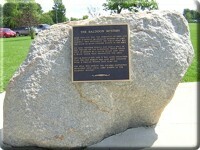 Today, only a plaque stands at the site of Lord Selkirk's failed colonization experiment in southwest Ontario, the Baldoon Settlement. The plaque, however, makes no mention of the otherworldly events that made this tiny Scottish settlement the region's first major tourist attraction in 1829. Infamous among Canadian paranormalists, the popular Baldoon Mystery has even served as the subject of a 1970s play penned by the award-winning writers James Reaney and Marty Gervais. On 28 October 1829, a pole suddenly crashed down from the ceiling as the women of the family and some neighbour girls were preparing straw in the barn, (The barn was made of logs, having above its main floor a ceiling of poles that formed a loft open at the ends and floored with the poles.) Startled but unnerved, the women assumed it was no matter and resumed their work. Several minutes later, a second pole dropped. Finding this strange, they examined the ceiling but could see no reason as to why the two poles had fallen. They resumed their work and forgot about the fallen poles as they became engrossed in conversation. Suddenly, a third pole crashed into their midst - now terrified, the women dashed out of the barn and into the house. Strange things continued to happen. Stones, seemingly thrown by phantoms, pelted the farmhouse until every window was shattered. When visitors and family members examined the stones, they found that they were smooth and damp, as though they had been flung from the bed of the river that ran right in front of the house. The roof leaked when it wasn't raining. Mysterious little fires broke out all over the house. "I saw the house take fire upstairs in ten different places at once," recalled William Fleury, who lived just up the road from the McDonald family. Once the earth moved the very foundations of the house - and only the McDonald house was shaken by this earthquake. Pots and pans inexplicably crashed from the counters and tables. "At the time of this trouble," reported local resident William Stewart, "I lived about three quarters of a mile from the place and was present and saw for myself many of these strange things. Mr. Alex Brown, with the others, took a number of lead balls that came in through the window, marked them, tied them in a bag, and dropped them in to the centre of the Channel Ecarte, in about 36 feet of water, and in a short time the ball came back through the window. I was present when the barn was burned and also when a man by the name of Harmon was preaching there. At this time a large stone came right through the door, breaking out one of the panels, and rolled in front of the minister. The stone apparently had come out of the water. A search was made about the house, but no person could be seen. I also saw a loaf of bread move off the table and dance around the room. 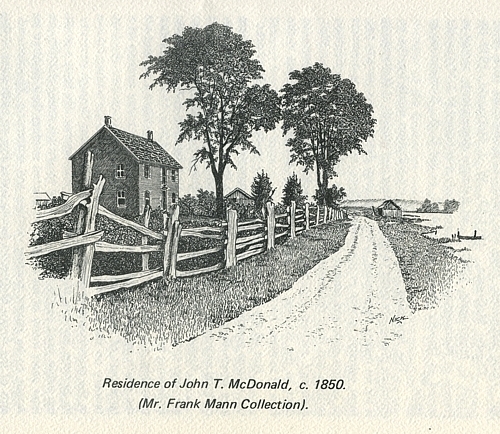 The owner of the house, John T. McDonald, I know to be a very respectable man." "I went with my father to see what was going on at Belledoon for I was very young at that time," H. Drulard later recalled. "We saw a pot rise from a hearth and chase a dog outside and all around the yard. It could not get away from the pot, for it would hit the dog and he would yell and howl with all his might. I saw an old fashioned butcher knife pass through a crowd of fifty men and strike into the wall the whole length of a ten-inch blade. This happened in 1830." After a local Methodist preacher, Reverend McDorman, tried to exorcise the spirits, the poltergeist became more violent: healthy livestock suddenly began to die in the middle of the night. Horses dropped dead in their stalls; the ox died in the field while still connected to the plough. Hogs and chickens withered and passed away. The family would awaken in the middle of the night to the slow, steady tread of men marching in the kitchen. Robert Baker, a Michigan schoolmaster who had a great interest in the subject of witchcraft, tried next to exorcise the spirit by nailing a horseshoe above the front door of the farmhouse and invoking the Holy Trinity. Not only were his efforts in vain, but local authorities prosecuted him for attempting to perform witchcraft. Mr. Baker was convicted at trial in Sandwich and sentenced to a year in prison; the Lieutenant-Governor, however, heard his appeal and granted him a pardon on 6 May 1830. And still the hauntings continued, and they became more violent. The baby screamed as its cradle rocked of its own volition; it was said that two men had to hold the cradle for the mother to rescue the infant. Guns went off while no one was holding them. The fires broke out with increased frequency and became harder to put out. And then the entire home burned to the ground. 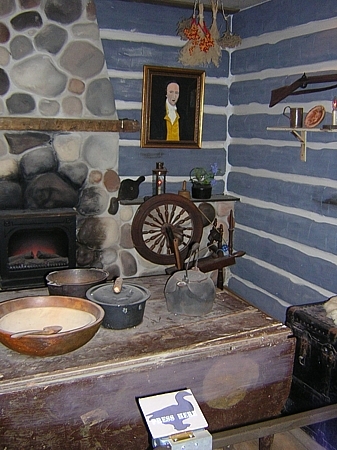 The community helped the MacDonalds to replenish the losses they had suffered in the fire, and the family of five sought temporary refuge with John's brother-in-law while they undertook efforts to rebuild their log cabin. But no sooner had they taken quarter when similar annoyances began to occur. After several little fires spontaneously broke out, the MacDonalds were forced to seek shelter elsewhere, fearing that the brother-in-law's house too would burn. The strange activity followed the family wherever it went; and for a period of time they lived like nomads, moving from place to place, unable to find solace. Finally they gathered up all the old sails they could find in the neighbourhood and rigged up a tent to shelter them. But they could not live like that for long; once winter set in, even the haunted log cabin was preferable to the frigid tent. After the family moved back indoors, John resumed all efforts to remove the poltergeist, seeking counsel from Protestant missionaries, native medicine men, and Catholic priests. Nothing worked. Then John learned from a traveller about a doctor in Long Point, a town eighty miles away, whose daughter was said to be possessed with the gift of second sight. Rev. 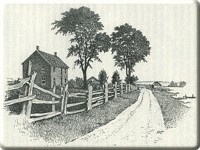 McDorman accompanied John on the two-day journey to the house of Dr. J. F. Troyner; upon arrival, they implored him to allow a consultation with the fifteen-year-old Dinah. The girl listened to John's miserable story, and then retired to her bedroom to read her moonstone. Miss Troyner emerged from her chambers, exhausted and dishevelled, three hours later and reported that an old woman who lived in a long log house sought to drive the MacDonalds from their property. This, said Miss Troyner, was the source of all John's difficulties. She asked John if he had seen a stray goose wandering his farm since the troubles had begun. 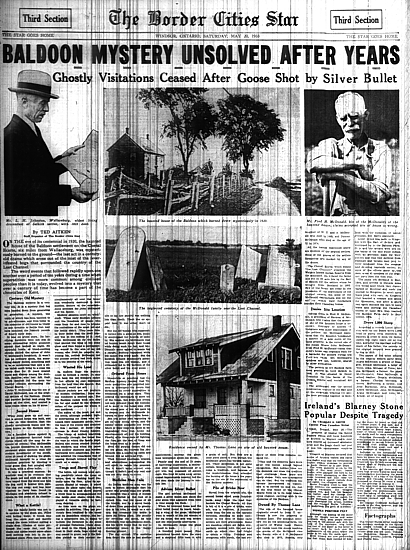 After he replied that he had been seeing a strange goose in his flock now and again for some time, Miss Troyner told him to shoot it with a bullet cast of solid silver, for lead would do it no harm. The girl insisted that the old woman would be similarly wounded, and the hauntings would come to an end. As soon as John MacDonald arrived home the next evening, he melted a piece of sterling silver into a bullet just as Miss Troyner had instructed. 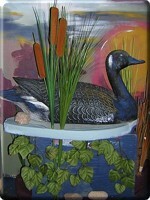 Rifle in hand, he searched for the goose in the field, and at first sight fired the silver bullet directly into its black wing. 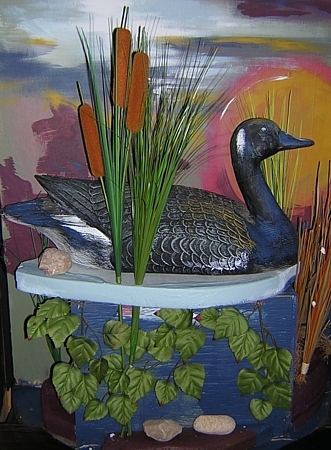 The goose gave a shriek like a human being in agony and escaped through the reeds under the cover of darkness. 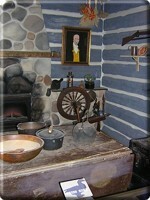 The next day, John and several companions ventured passed the long log house owned by the elderly Mrs. Buchanan. There the old woman sat on her front porch in an agitated state, nursing a broken arm. No more supernatural manifestations disturbed the MacDonald property thereafter. As the story passed into history, eyewitness testimonials from prominent local figures lent the tale credibility and assured the continued spreading of its fame. Forty years later, Neil McDonald, John's youngest son, interviewed twenty-six older local villagers that had witnessed the haunting. 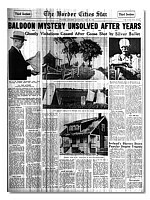 He collected their statements and published them serially in the Wallaceburg News; afterwards, the stories were collected into a booklet and published under the title, The Baldoon Mystery: An Intriguing Story of Witchcraft near Wallaceburg, Ontario. The story continued to circulate into the twentieth century: in the 1920s, the Northern Navigation Grand Trunk Route offered day-cruises from Detroit to Chatham aboard the Thousand Islander steamship. When the ship passed through Wallaceburg on the Chenal Ecarte, deckhands were quick to point out the "haunted house" to enthusiastic patrons. 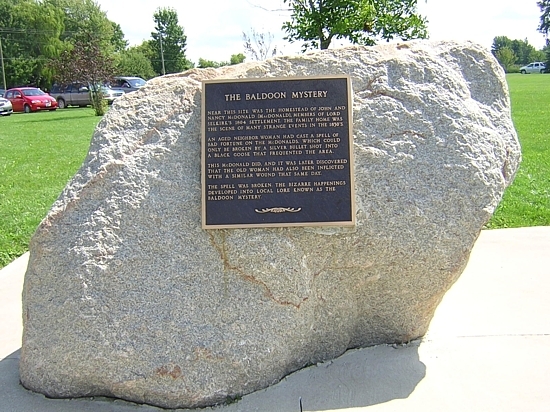 The Baldoon Mystery soon became one of Ontario's most famous ghost stories, securing a lasting legacy for the little Scottish settlement. McDonald, Neil T. The Baldoon Mystery: an intriguing story of witchcraft near Wallaceburg, Ontario. Alan Mann, ed. Wallaceburg and District Historical Society: Wallaceburg, Ont. 1986.